Samsung Onyx uses an LED screen instead of conventionally used projector systems to display movies. Samsung and INOX revealed the INOX Onyx screen in Mumbai that uses Samsung's Onyx cinema LED screen. Conventionally, movie theatres have used projection systems to display movies but Samsung is trying to change that with the world's first cinema LED screen through the Onyx. INOX Onyx is the country's second Onyx screen while the first screen was opened a few months back in Delhi with PVR Cinemas. Because of the use of an LED screen, movie-goers will be able to enjoy a better contrast ratio, visual quality and 3D performance. These screens also support HDR playback and since they are backlit, the brightness levels are greater where Samsung claims it to be about 10 times greater than the projection systems. 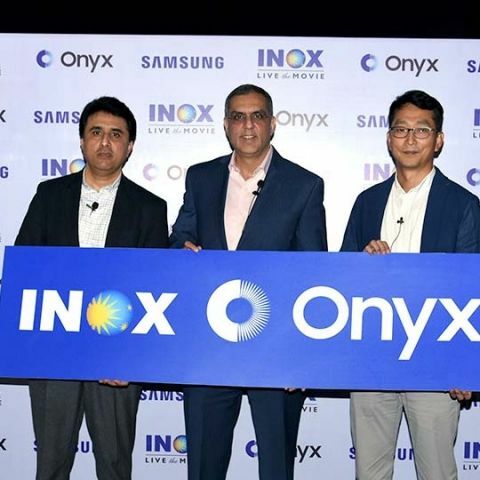 MUMBAI, India – December 05, 2018 – Samsung India, the country’s largest consumer electronics company, and INOX Leisure Ltd, India’s leading multiplex chain, today introduced ‘INOX Onyx’ to Mumbai, ushering in the future of cinema to the land of Bollywood. The world’s first Cinema LED offers most powerful, captivating and larger-than-life visuals thus, making the cinema viewing experience as natural as you would watch it in real world. This cinema redefining technology – Onyx - is a game changer in the film exhibition industry and is only DCI compliant LED display. INOX at Malad, Inorbit Mall will play host to Mumbai’s first Cinema LED Theatre. “Onyx, another transformational innovation by Samsung, will change the way we watch movies and will mark a new chapter in the history of cinema. The hundred year old projection technology will be a thing of the past. With INOX Onyx, welcome true colours, bring alive the LED Screen with real life like picture quality and exhilarating sound. We are elated to partner with INOX in our endeavour to revolutionize the movie viewing experience in the city of dreams - Mumbai,” said Mr. Puneet Sethi, Vice President, Consumer Electronics Enterprise Business, Samsung India. The Onyx display easily accommodates any venue configuration while delivering unmatched visual quality, technical performance and reliability over traditional projectors. The screen maintains its advanced presentation capabilities in ambient lighting conditions, regardless of the featured on-screen content. The screen also offers state-of-the-art Onyx surround sound experience from JBL by Harman International and Samsung’s Audio Lab, bringing scenes to life through’ clear and precise audio. This integration eliminates rearward bias by expanding the audio “sweet spot”, while ensuring that all attendees can enjoy the same experience regardless of seat location, within the theatre. Onyx VIEW, combined with an infinite contrast ratio and specialized low-tone greyscale settings delivers brighter and more detail-rich content. The screen delivers High Dynamic Range (HDR) to the cinema, showcasing on-screen contents at peak brightness level - nearly 10 times greater than that offered by standard cinema projectors (146fL versus 14fL). The display delivers improved uniformity, free of optical distortion and interference. It is industry’s first DCI-certified cinema display available in variations extending between 5, 10 and 14 metres in width. iPad Pro 12.9. screen display led or lcd or??? Is Samsung galaxy S5 has Capacitive touch screen ?